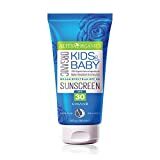 Natural (Bio) NaTrue certified organic sunscreen for kids and babies with sun protection factor SPF30, high quality protection from the harmful effects of UVA and UVB rays. Specially created for the tender and delicate baby skin, this product gives you total peace of mind as it provides reliable protection from the sun for your child`s skin without containing any harmful chemical ingredients. Totally natural, safe and effective, it creates a thin but sufficient protective layer that provides safety, hydrates and balances the skin. Thanks to the rich bouquet of organic oils and extracts, including the highly beneficial for the sensitive baby skin combination of chamomile, calendula and lavender essential oils, it provides the best possible solution for your child toddler or baby when they are about to be exposed to the effects of the sun. Suitable for daily use, easy to apply, water resistant for 40 minutes. Apply generously (2mg/cm) 15 minutes before sun exposure. Apply as a protective layer on top of the skin, do not rub into the skin. Reapply after 40 minutes of swimming or sweating, immediately after towel drying or at least every 2 hours. This entry was posted in Buy Supplements and tagged 90ml, Alteya, Baby, Certified, Extra, Ingredients, Kids, NaTrue, Natural, Organic, Protection, Purely, safe, Sunscreen by TOSMS. Bookmark the permalink.